Ribbon cuttings are a common thread at opening events. They symbolize new beginnings with the same exuberance that a giant, cardboard check uses to symbolize a big donation. That single ribbon, often bright red, ceremoniously falls to two sides and elicits applause and cheers. But the Oak City Cares ribbon cutting, like some of the event’s speakers, didn’t follow a script. It had a heart of its own. The ribbon wasn’t red, but green (to symbolize the city of Raleigh), blue (for Wake County) and orange (for Oak City Cares.) It wasn’t a single ribbon, but rather three ribbons braided together. And, as honored guests used golden scissors to do the honors, the ribbon fell into more than two pieces. 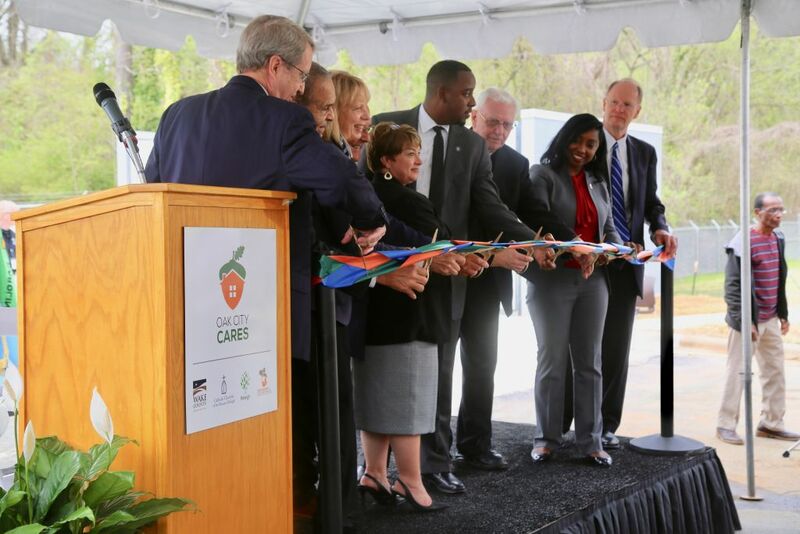 It was a fitting symbol for the center, which was created to serve those experiencing homelessness and was brought to life by Wake County, the City of Raleigh, the Partnership to End Homelessness and Catholic Charities of the Diocese of Raleigh, the center’s operating partner. 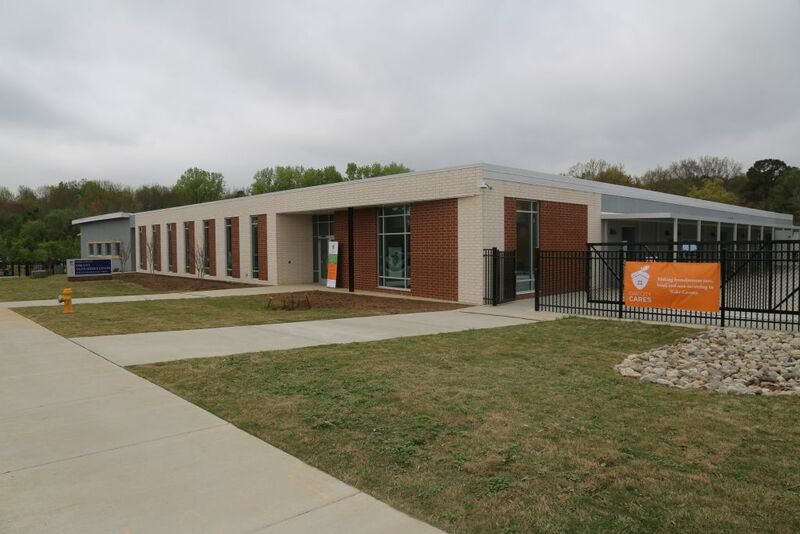 Oak City Cares will be located at the Oak City Multiservices Center at 1430 S. Wilmington Street in Raleigh. Oak City Cares, which operates out of a newly remodeled building on Raleigh’s South Wilmington Street, is a multi-services hub for those experiencing homelessness in Wake County. It’s supported by the collaboration of more than 20 agencies, such as the Kaleidoscope Project, which assisted with the indoor family recreation room which provides a learning space for children and families. Oak City Cares connects individuals and families to health and human agencies whose programming will be coordinated on site. According to organizers, the coordination removes barriers that hinder people from accessing essential services. 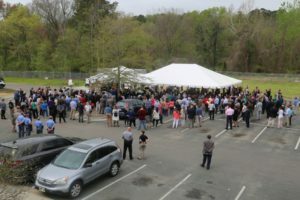 Hundreds attended the April 8 ribbon cutting program, which was held just outside the building where Oak City Cares operates. That spirit of cooperation was echoed by the speakers, who were happy to celebrate the completion of the building, formerly a warehouse, which Wake County and the City of Raleigh invested a combined $10.4 million in for purchase and renovation. Speakers were also quick to note that there’s still much work to do. Students from Raleigh’s Enloe High School were on-hand for the ribbon cutting. Their 2017 gift of $180,000 – which was raised by their annual Charity Ball – was one of the first according to Rick Miller-Haraway, director of the Raleigh Regional Office of Catholic Charities. “The seniors that year loved how the money would go toward the outdoor pavilion and other outdoor space … something new that people could see and visit,” student Sanjana Tharuvesanchi said. The organization’s new executive director, Kathy Johnson, spoke about the three programs the center will offer, which are: Basic Needs (such as showers and laundry), the Weekend Meals Program and the Care Coordination Program. Her remarks also focused on the community center aspect of Oak City Cares. “Everyone can find a way to be involved … whether it’s as a volunteer … donating items from our wish list or making donations of any size to help us provide services to our guests, there is a way for you to be involved,” Johnson said. Oak City Cares began providing weekend meals on Saturday, March 30, and will begin weekday programming on Wednesday, April 10. For more information about how to access services or to support Oak City Cares, please visit www.OakCityCares.org. According to Catholic Charities, nearly 5,500 people in Wake County experienced homelessness last year, and that number increased by 25% over the prior year, even as it declined in North Carolina overall. On any given night in Wake county, approximately 1,000 people are homeless. In the 2016-2017 school year, nearly 3,500 students in Wake County Schools were identified as homeless.